To draw a simple example, take two content providers such as the Verizon website and the University of California website. If net neutrality were upheld, both entities would pay their monthly fees to the network provider and if all else equal, any bit of information from the Verizon website will make the same trek as one from say the UC Berkeley website. There would be no roadblocks or shortcuts any of the websites can take to make the end user desire their content more. However, without a neutral stance in what is carried over their pipes, network providers can choose to discriminate and decide how fast data will be transmitted and at what quality. So in our example, say Verizon (which is also a network provider) chooses to prioritize their data over that of UC Berkeley. Information from Verizon will then be more desirable to the end user since it is so much faster than the UC website. The problem then arises when Verizon is trying to promote something opposed to that of the beliefs of the University of California. Is it fair that Verizon has these advantages over the university? What would happen if network providers bar content providers that they think have a conflict of interest from using higher speed networks? What if the network providers degrade the service of specific content providers? These are just some of the many questions that plague the net neutrality issue. Net neutrality is the concept that all Internet traffic should be treated equally. Internet service providers (ISPs) like Comcast or Verizon control how you access websites and content. Let’s use an old-school metaphor: the information superhighway. Think of ISPs as the freeway on which your content travels from a website to your home. An Internet governed by net neutrality would bar ISPs from creating special toll lanes for fat cats. Everyone would have the same speed limit. Isn’t that how things work now? Transparency: ISPs should be open about how they handle traffic. No blocking: As long as content is legal, an ISP is not allowed to block any site, service or device. No unreasonable discrimination: ISPs are not allowed to favor some traffic over others. But in January, the D.C. Court of Appeals struck down the rules that the FCC had put in place to ensure net neutrality. The court said the FCC does not have the authority to require ISPs to treat traffic equally. The court told the FCC it had overstepped its bounds and needed to rewrite the rules. Today, the FCC will propose a new set of rules to regulate ISPs and attempt to re-establish net neutrality or something close to it. 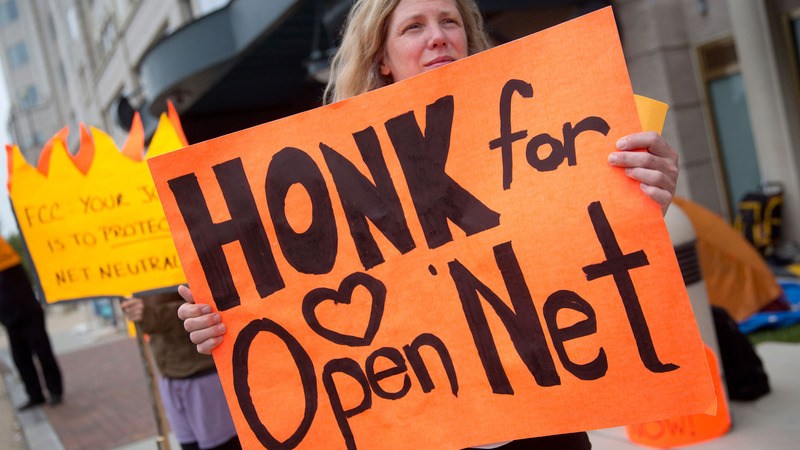 Net neutrality advocates worry that the new proposal will abandon the idea of net neutrality. The FCC says it is trying to create effective regulation. Why does the FCC get to regulate the Internet? No entity is in charge of regulating the Internet, but the FCC is as close as it gets in the United States. The agency oversees the ISPs, a role that makes it the watchdog of the Internet’s infrastructure. An Internet toll road doesn’t sound so bad. What’s wrong with paying for a faster connection? Worst-case scenario: the Internet becomes more like cable TV. Net neutrality advocates argue that the Internet is a success because it is an equal-opportunity medium for innovators and startups. But if big companies like Amazon and Netflix pay for a quick connection, there would be little incentive for the ISPs to provide good connections to everyone else. A startup might not have much of a chance if most of the Internet has slowed to a crawl while Netflix streams smoothly. Such a shift wouldn’t happen overnight, but critics contend that it would push the Internet toward a system akin to cable TV, where the service providers are the gatekeepers determining which content reaches consumers. Having enough money to pay ISPs would become essential to operating a successful website, meaning ESPN.com would do just fine but your sports blog wouldn’t. Going back to our freeway metaphor: In an Internet where there’s a shiny, well-maintained series of lanes for companies like Netflix, your road could become a decrepit, crowded single lane that is barely operable. And some content providers like Netflix, which accounts for a huge percentage of online traffic, don’t want to pay extra tolls. The proposed rules are not final. The FCC is seeking input for 60 days, a period that will be followed by 57 days of reply — on how best to proceed to protect the Internet, including the potential to regulate Internet as a utility. The FCC has asked for public comment on new rules about net neutrality. Use this form to submit a comment to the FCC. Learn more about the FCC rulemaking process.